I am completely in love with this outfit made by Michelle from PinQue. The main reason why I like it so much is because of all the warm colors she used. 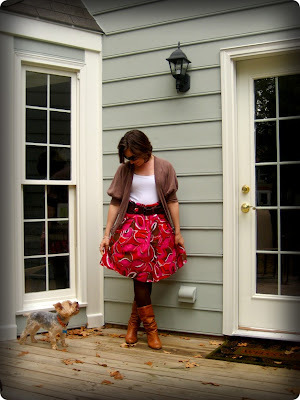 I love how she paired this beautiful pink colored skirt with different tones of brown throughout the entire outfit. My favorite item is the caramel colored boots, simply to die for!... I really love the entire look, its perfect for fall! What do you all think? I love the boots too! I wish it wasn´t so hot in Panama so that we could wear leggings and boots every day!